Vancouver, B.C. – With sweeping expanses of new public space, the Vancouver Aquarium – Canada’s pre-eminent marine science centre – is opening new doors today in celebration of the most significant expansion in its 58-year history. 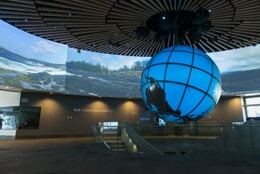 At the centre of this expanded space is the Teck Connections Gallery, the central hub of the new Aquarium with state-of-the art features including 360-degree, 185-foot digital screens alive with stunning aquatic imagery. The revitalized, sustainable, state-of-the-art marine science centre incorporates elements of water and aquatic wonder throughout, with curvilinear design that reflects the organic, flowing nature of the natural world. Sunlight shimmers off dual-coloured pink-and-green metallic Alucobond® paneling – mimicking fish scales – on the new exterior walls. 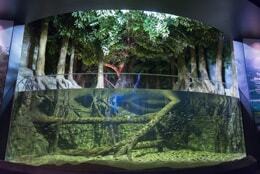 A watery veil of eight-by-eight foot (2.4-by-2.4 metre) LED video displays covered with flowing water greets visitors as they enter through the Aquarium’s new visitor entrance. A 100-foot (30-metre) water wall on the left side of the building with cascading natural rainwater flowing over fish-shaped glass blocks reminds us of the importance of water, one of the earth’s most precious resources. The Aquarium’s new design endeavors to take every opportunity to immediately connect visitors with water and our oceans – the first engagement point in ultimately inspiring action to conserve nature. The Aquarium’s expansion would not have been made possible without the generous support of Teck, which provided $12.5 million to support the expanded facilities as well as important aquatic research and conservation work across British Columbia. As visitors make their way to the Aquarium through beautiful Stanley Park, the trees slowly give way to a more open natural landscape, replanted entirely with local west coast plant species. 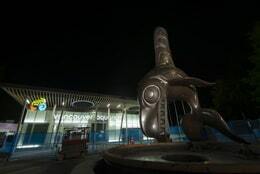 Immediately recognizable, and identifying the new main Aquarium entrance, is the iconic bronze killer whale sculpture Chief of the Undersea World, created by renowned Haida artist Bill Reid. A simplified ticketing process allows guests to quickly enter and start their journey as they walk through the Ocean Courtyard, a spacious new outdoor public meeting space full of life with an outdoor dining area and family-fun activities through the summer months. From the Courtyard, visitors enter the main building and into the inspired Teck Connections Gallery. 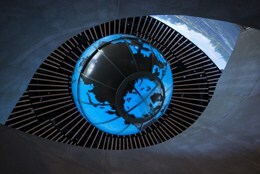 The centrepiece of the gallery is a stunning 14-foot (4.3-metre) glowing blue globe, instantly recognizable but strangely unfamiliar, as the earth has been “turned on its head” with the North Pole at the bottom, enabling visitors to see Canada more easily, and highlighting Canada’s changing Arctic region. Visitors then descend the double staircase to the Teck Engagement Gallery on the lower level, bringing them to an amphitheatre-style seating area ideal for public programs, talks and educational interactions, while nearby, a changing exhibits gallery lends future space for large temporary living exhibits and displays. The Vancouver Aquarium is grateful for the Government of Canada contribution of up to $15 million through the Building Canada Fund – Major Infrastructure Component and $10 million from the Government of British Columbia. This combined support has enabled the Aquarium to expand its connections to more than one million visitors a year. These connections directly engage Canadians and visitors to Canada’s Arctic, issues facing our oceans and the role we each play in protecting our ailing waterways. As part of its green commitment, the Aquarium expansion continues to reflect the organization’s long-standing commitment to sustainability by meeting environmental standards established for a LEED® Canada Green Building Design & Construction rating. These features include a District Energy System loop, a new facility-wide, energy-efficient heat exchange system that heats and cools the building and animal exhibits in the most energy-efficient way possible; rainwater harvesting that allows the use of grey water for irrigation and toilet flushing; and maximized reuse of recycled materials throughout the facility. This is the first of three planned phases of revitalization for the Aquarium. Totaling approximately $45 million, this first phase also includes new aquatic habitats featuring a diverse array of animals from around the world, such as a new Fly River exhibit featuring animals from New Guinea, a new exhibit with schools of cichlids from Lake Malawi in Africa, a Red Sea coral reef exhibit, a new Jamaican fruit bat exhibit, and two new quintessential British Columbian displays – one featuring aquatic life from B.C.’s Gulf Islands, and an Ocean Wise™ display featuring a stunning school of coho salmon. Welcomed features also include a new café and coffee bar, with indoor seating and cantilevered doors that open onto the outdoor Ocean Courtyard; a completely revamped gift shop, where proceeds directly support the Aquarium’s conservation, research and education programs; a revitalized Clownfish Cove, featuring a new experience for young children and their adult guests; and additional washroom facilities, lockers, and landscaped public park space that includes a concession stand and washrooms available for all park visitors. These new exploratory visitor spaces make up just a portion of the total 55,000 square footage added in this initial expansion phase, which includes behind-the-scene areas, mechanical rooms, public park space and office space. This phase of expansion was made possible by the creative design and architectural expertise provided by Musson Cattell Mackey Partnership. The Aquarium also appreciates the project management of Turnbull Construction Services Ltd., the construction capabilities of PCL Constructors Westcoast, Inc., and the services of very many talented consultants and contractors who helped to bring this immersive experience to life.